The Warriors closed as prohibitive 16-point home favorites against Phoenix on Monday night and they played the part with a lopsided 129-83 victory. This was their third win in a row both straight-up and against the spread; covering as double-digit favorites at home in all three games. Golden State heads on the road for Wednesday night with a SU 22-6 record while going 13-15 ATS in their first 28 road games this season. Four of five starters scored in double figures on Monday night led by Stephen Curry’s 22 points. The Warriors shot a blazing 58.4 percent from the field; connecting on 11 of their 26 shots from three-point range. Draymond Green missed the game against the Suns with a finger injury and his status for Wednesday night is listed as day-to-day. Golden State has scored at least 120 points in each of its last three games. Portland comes into this game with a 2-4 record in its last six games both SU and ATS after losing to Utah 115-96 on Sunday as a four-point home favorite. The loss snapped a SU nine-game winning streak at home while going 7-1-1 ATS as part of an overall record of 16-11 at home this season with an 11-13-3 record ATS. The total has gone OVER closing line in four of their last five home games. 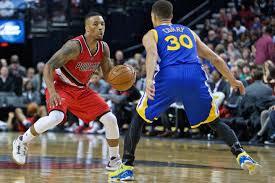 Damian Lillard scored a game-high 39 points on Sunday in the losing cause. He continues to lead the Trail Blazers in scoring this season with an average of 25.8 points per game. He is shooting 44.4 percent from the field on the year and he connected on 12-of-25 shots against the Jazz. Portland is ranked 17th in the NBA in scoring with an average of 104.7 PPG and it moves to ninth at the other end of the court in terms of points allowed (103.7).